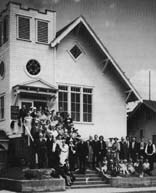 First Lutheran Church of West Seattle was established officially on September 25, 1918 after nearly nine years of missionary work by the Reverend Hans Oppedal from what is now Ballard First Lutheran Church, the Reverend Olaf Holen from what is now Phinney Ridge Lutheran Church, and The Reverend Erick B. Slettedahl from what is now Denny Park Lutheran Church in Seattle. Our first called pastor, the Reverend Hans H. B. Wogter began March 21, 1920. Our first church building, a wood structure, was built between spring and summer in 1918 on the corner of 44th Street and Dakota (pictured left). The dimensions were 28 by 48 feet with an estimated construction cost of $2,000. We have a model of the church on display in our lounge. We are grateful to Stanley Sears for building this model for people to enjoy. 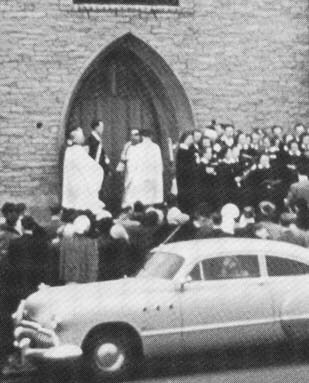 We first worshipped in our present building, Palm Sunday, April 2, 1950. Our church building was designed by Mr. Rolland Denny Lamping, a great-grandchild of Arthur A. Denny, one of Seattle's founding fathers, and from the architectural firm of Lockman, Ayer, Lamping and Broman in Seattle. Built by Anderson Construction Company this neo-Gothic church building is 100 feet in length, 45 feet wide and 48 feet in height. The interior is adorned with magnificent stained glass windows, concrete arches and pillars; vaulted beam ceilings; and a 25 ton terrazzo floor. Our Parish House (education and office building) was dedicated on May 4, 1958. It was designed by the architecture firm of Durham, Anderson & Freed, and was built by the George E. Teufel Company. 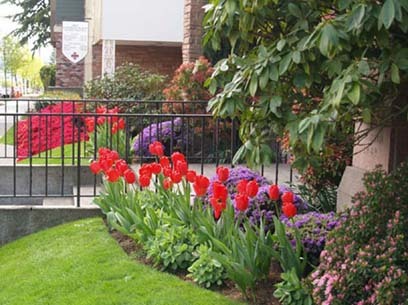 Go to http://www.blinkx.com/videos/first+lutheran+church+of+west+seattle to see video of our 90th Anniversary! First Lutheran Church of West Seattle has been blessed with a gift of windows for the delight of the parish as well as those visitors who pass through or doors. 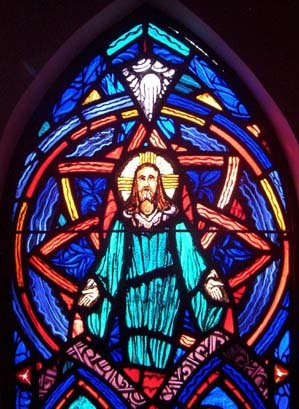 The Great Altar Window was the first to be designed, created and installed by Anton Rez of Clinton, WA in the early nineteen-fifties. The most dramatic and artistically stunning window in the collection, is laid out as a triptych, or three paneled window, framed in a large gothic arch and recessed into the chancel wall above the High altar. 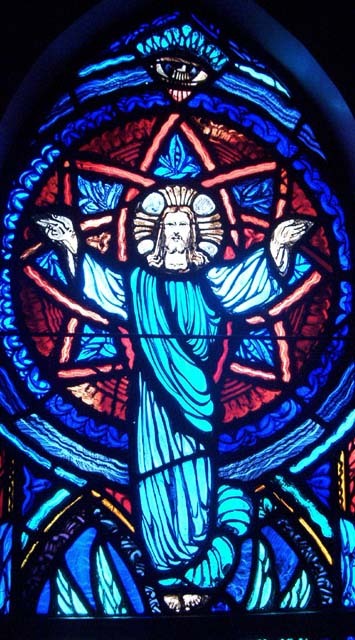 The theme for this magnificent window, the crown jewel of the collection, is the Life of Christ. 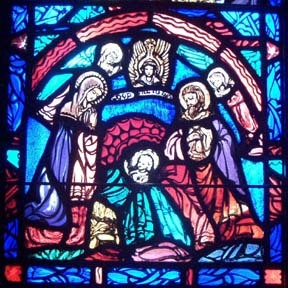 Depicted scenes are the Nativity, the Boy Jesus in the Temple, the Baptism of Jesus, and Healing Jesus, the Teaching Jesus, the Last Supper, the Crucifixion, the Resurrection, and the Ascension. 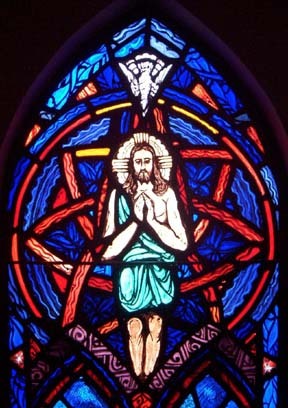 The window is newly framed in the oak reredos just finished in June of 2005. This reredos is an architecturally designed (by noted Seattle architect Stephen Lee) and expanded version of one purchased in 2004 from Luther Memorial Church which closed its doors after 112 years of mission in Tacoma, WA. The north aisle of the nave contains three windows: The Wheat and Bread, St. Paul, Apostle and Missionary, and The Chalice. The Four Evangelists are pictured in the windows along the south aisle of the nave. Centered between the Four Evangelists is the Holy Scripture window illustrating the collection of divinely inspired writings of the Old and New Testaments. The Chapel Windows are the newest addition to our stained glass windows being installed in January 1988. These beautiful windows were designed by Robert & Jill Hill of Hill Associates, Snoqualmie, WA. 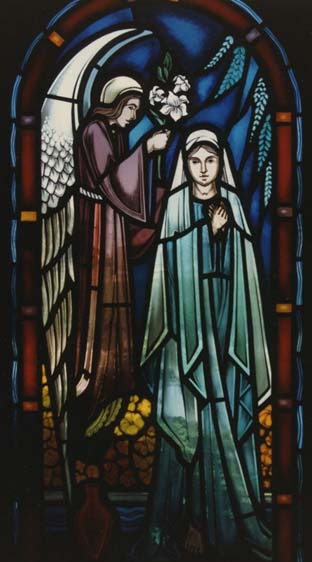 The theme of the windows is "Praise to God" with the Annunciation, the Visitation and the Presentation being depicted. 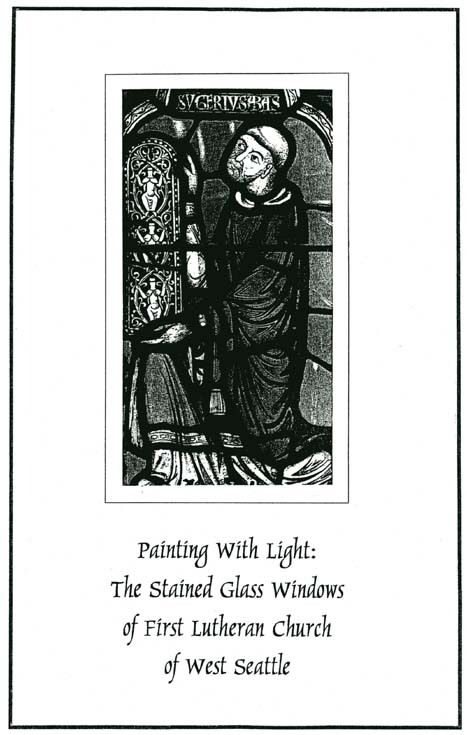 Hill Associates are also responsible for our Engraved Narthex Window Screen (1985). This ten piece set of hand engraved windows represent the three great water themes in the Old Testament that are incorporated into the rite of Holy Baptism in Martin Luther's famous flood prayer of 1523. These three themes are the Creation, the Flood, and the Exodus through the parting of the Red Sea. 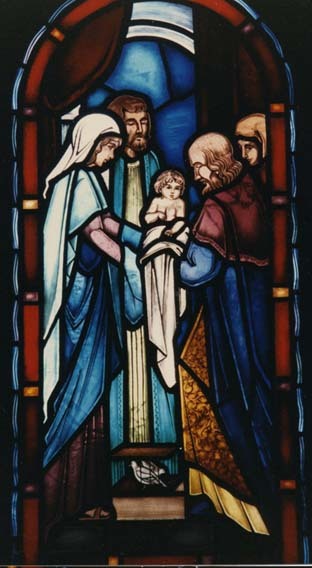 Painting With Light: The Stained Glass Windows of First Lutheran Church of West Seattle (2000). By the Dean Walter Hard, 20 pp. 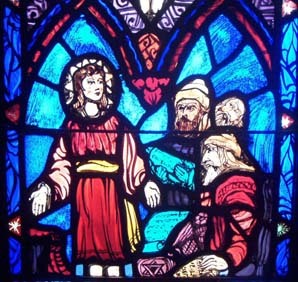 This walking tour of the stained glass windows and engraved narthex window screen of First Lutheran Church of West Seattle is a detailed account of our beautiful windows. Here you will find the story revealed in the symbolism, and the history in the making of these fine pieces of art. From the FORWORD: There are three major sets of windows in our church; the nave windows, the engraved narthex window screen and the chapel windows. All of them are of wonderful design, rich depiction, and striking presentation. The nave set, including chancel and gallery, is made up of twenty-one richly colored stained glass windows installed between 1953 and 1955, designed and created by Anton Geza Rez. 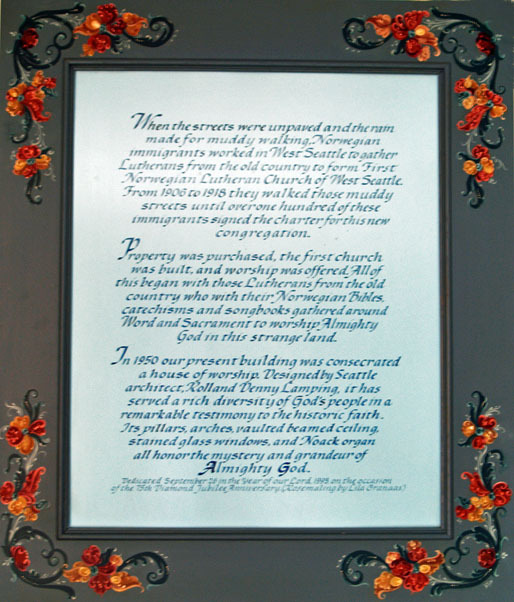 The engraved narthex window screen and the chapel windows were designed and created by Robert and Jill Hill of Hill House Studio, Anacortes, WA. In 1988, after an extensive examination of the stained glass installed in the early 1950s, the church asked Robert Hill to begin a full restoration of all twenty-one windows, beginning with the removal of the Great Altar Window in December of 1988. The restoration project continued for the next four years with the completion of all 21 windows in July of 1992 at a cost of $33,574. Email us at deogloria@foxinternet.com or write us at 4105 California Ave. SW, Seattle, WA 98116 or call us at 206-935-6530 to place your order.